Water Cannon provides multiple hydraulic driven pressure washing systems for uses such as portable restroom cleaning applications, including an Annovi Reverberi washdown pump with a 5-year manufacturers warranty. 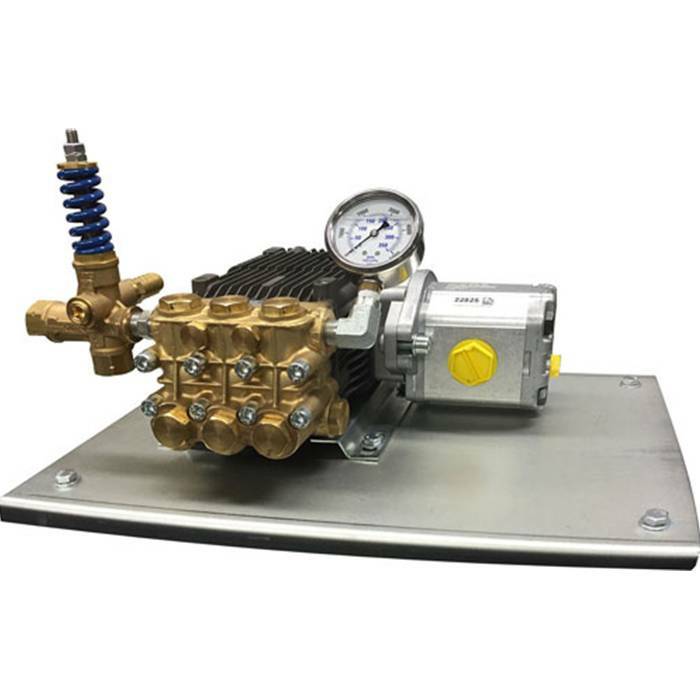 As an example the washdown pump, model number WCHYD3025 rated 3.0 GPM at 2500 PSI, can be mounted to most trucks and connected to existing hydraulic systems. Since this unit is hydraulic fluid driven, no electric power or gasoline is required; a water supply is all that is needed. Complete plumbing for easy installation is provided with this unit as well. To complement its hydraulic drive pressure washers and allow operators to conserve their time and energy, Water Cannon also offers a universal spinner attachment from Mosmatic that effortlessly reaches into small nooks and crannies all without exposing the user to the hazards of backsplash. For more information, call 1-800-333-9274. Requires 6.25GPM @ 1500PSI Hydraulic to drive this unit.